During the National Platform of Joensuu on October 24-26th, it has been decided the creation of a national ESN network with its own statutes and board. 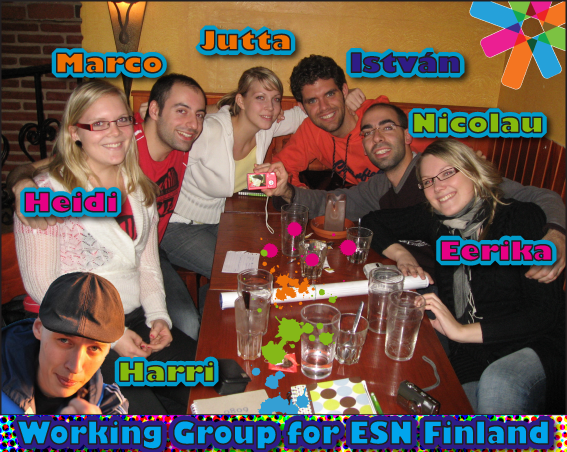 Heidi Hietala, NR of Finland, promoted the set up of a working group for ESN Finland. The National Platform approved the proposal and elected the members of this WG. The working group's President was Eerika Hedman (ESN JYY), the other members were Harri Lähdekorpi (ESN JYY), Nicolau Goncalves (ESN TKY), István Mák (vice-NR), Jutta Pietiläinen (ESN HYY), Marco La Rosa (ESN HYY) and Heidi Hietala (ESN Åbo Akademi). The WG presented at the National Platform of Rovaniemi the draft of the Statutes and the Standing Orders which were voted and approved by the Finnish sections, therefore the structure of the national network has been voted too and the first National Board elected.